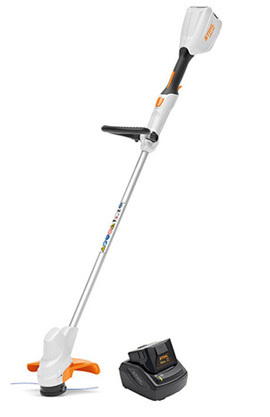 Cordless linetrimmer with very high-performance mowing for grass trimming and clearing work. Cutting circle diameter of 280 mm, soft grip, adjustable loop handle, the mowing line automatically readjusts when the mowing head is tapped on the ground. Quiet, no ear protection needed. Comes with AK 10 battery and AL 101 charger as standard.